Limited Spaces Available! For reservations call (866) 608-7185. Spaces are extremely limited this time of year so book early to ensure the date you want. You can witness the fantastic creatures of the undersea environment that surrounds the Florida Keys at the Key West Aquarium. You will be astounded by the biodiversity and incredible aquatic beauty behind the massive viewing windows. Our knowledgeable tour guides will enlighten visitors about the fascinating marine environment off the coast of Key West. The Aquarium houses a diverse array of fish species including huge grouper, slithering morays, toothy barracuda, prismatic tropical fish like parrotfish, large tarpon, and many other species. You will have the unique experience of witnessing the daily feedings of sharks, sea turtles, and rays. You will be delighted while seeing these creatures feed in a naturalistic environment that replicates the habitat off the shores of Key West. Our ichthyologist staffers will educate visitors about the biology, diet, behavior, and habitat of these remarkable marine animals. You will even have a chance to pet the smooth skin of a live shark. Our interactive touch tank allows participants to physically touch and even pick up the harmless creatures. This tank replicates the shallow-water environment that surrounds the Florida Keys. Children are especially delighted to engage with creatures in a tactile manner. One of the main attractions in the aquarium is the fifty-thousand-gallon Atlantic shore exhibit which displays a representation of the local mangrove back country. 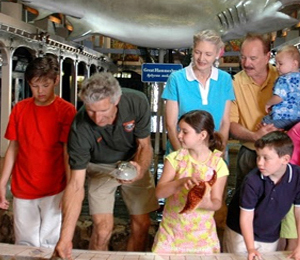 In addition to providing an interactive place for vacationers to observe the fabulous marine species of this region, the Key West Aquarium is dedicated to preserving the population and habitat of threatened species like sea turtles. We are closely affiliated with the local Turtle Hospital as well as the Florida Sea Turtle Stranding Network which includes a conglomeration of state agencies, universities and marine parks, all committed to the rehabilitation and treatment of sick and wounded sea turtles. The Key West Aquarium usually houses quite a few turtles in the process of rehabilitation. The turtles that are healthy enough to return to the wild will be released, while others with ongoing medical conditions will remain in the Key West Aquarium. Key West Visitor Guide is always interested in your tour experience with us. We hope you enjoyed your tour and love to hear comments. I have been to the Bahamas many times, but Key West Aquarium is one of my favorite trips! It includes everything that everyone should do here. As a Bahamas veteran, I can say only the best about this experience!